As Sonoma County Master Gardeners, the Food Gardening Specialist (FGS) project’s mission is to provide science-based horticultural information and to teach home and community gardeners how to grow food sustainably. When you grow food sustainably you nurture and protect the soil; use compost and organic amendments to feed the soil organisms that, in turn, feed your plants; use mulch to cover your soil, prevent weeds and conserve water; practice minimum soil disturbance; plant the right plant, in the right place, at the right time; include flowers that benefit the vegetables and that attract good insects; and avoid using synthetic fertilizers, herbicides and pesticides. Food Gardening Specialists have specialized food gardening training and experience. In addition to their horticultural knowledge and interests, they are all passionate food gardeners—many with years of first-hand experience growing crops in their own Sonoma County microclimates. They successfully combine their personal food gardening expertise with advanced and continuing education. The Food Gardening Specialist project has dedicated relationships with four Sonoma County community gardens: Bayer Farm, Harvest for the Hungry, Stony Point and Windsor Town Green, providing advice and consultation services as well as classes on specific food gardening subjects. Specialists maintain a food and pollinator demonstration garden at Bayer Farm which is open to the public (1550 West Avenue, Santa Rosa). Specialists also provide advice and consultation to other county community gardens. Services provided include, for example, irrigation methods as well as food gardening with less water, weed control, integrated pest management, soil management, diagnosis of poor crop production, composting, seed-saving and plant variety selection. 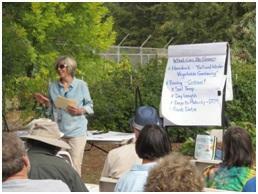 Food Gardening Specialists present free food gardening workshops for Sonoma County home and community gardeners. 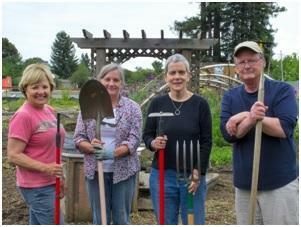 Most workshops are held in one of the four core community gardens and are listed on the Sonoma County Master Gardener workshop calendar. Workshops may involve comprehensive basic food gardening education, an A to Z approach to food gardening, or may consist of modules addressing the components of sustainable food gardening, or may involve a narrow food gardening subject and/or hands-on activity such as fruit tree pruning, container gardening or food gardening with less water. Helpful, pertinent handouts are provided to workshop participants. The Youth Garden Project operates under the leadership of the Master Gardener Food Gardening Specialists. The project supports the development and maintenance of sustainable gardens in school and after-school programs in Sonoma County. 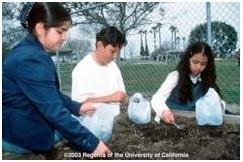 For more information about the activities and services of the Youth Garden Project, click here.